On Monday at the White House, President Donald J. Trump hosted a Salute to the Heroes of U.S. Immigration and Customs Enforcement (ICE) and U.S. Customs and Border Protection (CBP) to recognize the dangerous, important work of America’s border officers. 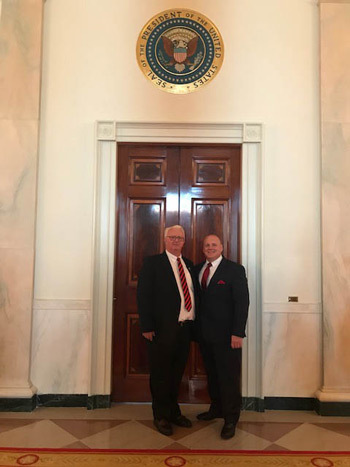 Reps. Jerry Knowles (R-Berks/Carbon/Schuylkill) and Doyle Heffley (R-Carbon) attended Trump’s recognition of these men and women who serve our nation as federal law enforcement officials. They are pictured here in the White House. HARRISBURG – On Monday at the White House, Reps. Jerry Knowles (R-Berks/Carbon/Schuylkill) Doyle Heffley (R-Carbon) were honored to attend President Donald J. Trump’s Salute to the Heroes of U.S. Immigration and Customs Enforcement (ICE) and U.S. Customs and Border Protection (CBP). The event was held to recognize the dangerous, important work of America’s border officers. “The work these officers do is crucial to ensuring the safety of Americans,” said Knowles. “I was honored to have the opportunity to join President Trump in saluting them for their bravery and dedicated service. It was definitely a once-in-a-lifetime experience to be sitting in the East Room of the White House with the president and the vice president talking about national security. “ICE and customs officers risk their lives protecting our borders every day and we owe them a debt of gratitude,” Heffley said. “Yesterday, we were in a room full of federal law enforcement officials and families of fallen officers, including those who have saved countless lives on the border and beyond. It was humbling to see the president honor these fallen ICE agents, who in addition to keeping us safe, were also family members, friends and neighbors. ICE and CBP officials help prevent criminal illegal aliens, gang members and deadly drugs from being able to flood into and remain in communities across the nation. In 2017, ICE removed 226,119 criminal illegal aliens, and ICE Enforcement and Removal Operation (ERO) made 143,470 administrative arrests. In 2016, nearly 629,000 visa overstays were recorded in the United States. The agencies were created under the Department of Homeland Security in 2003, following the terror attacks on Sept. 11, 2001. Through a unique combination of civil and criminal authorities, they work to protect our national security in a number of ways, including immigration enforcement, investigating illegal movement of people and goods, and preventing terrorism. House Bill 28, being sponsored by Rep. Martina White (R-Philadelphia) would hold any municipality that has deemed themselves as a “sanctuary municipality” liable for damages to persons or property as a result of criminal activity by unauthorized aliens if certain criteria is met. Knowles and Heffley are both co-sponsors of this bill. Additionally, Knowles introduced House Bill 14 in January 2017 to prohibit any institution of higher education in Pennsylvania that deems itself a “sanctuary campus” from receiving appropriations from the state. Heffley is a co-sponsor of this legislation.